We interrupt this weeklong train of political thought for a refresher – today is the first day of college basketball season. For fans like me, that means an exciting game tonight between No. 3 Kentucky, the defending national champion, against the upstart Maryland Terrapins in the new Barclay’s Center in Brooklyn. Maryland will be good as the season develops and it will be interesting to see how Dez Wells performs. He’s the Xavier guard kicked out of school over sexual assault charges that apparently weren’t substantial enough to warrant prosecution. I’m not in a position to judge him any way other than by his performance on the court. The NCAA has ruled him eligible to play this year, without the usual one-year wait. new ESPN series, “Kentucky: Full Access,” or as John Feinstein calls it, the best recruiting tool in the history of sports. You get an idea of the mania that grips my home state this time of year, every year. The Wednesday night series follows Coach John Calipari through another season of rebuilding – six new core players on a team that lost six to the NBA draft, including No. 1 and No. 2. When 25,000 people show up at Rupp Arena to watch the first practice, “Midnight Madness at UK,” Calipari takes the mike and tells the people, “You all are crazy, you know that, right?” Standing ovation. The “one-and-done” rule in college for NBA prospects is a fact of life, and Calipari has managed to corner the market on the best kids looking for a springboard to the NBA. By contrast, consider my alma mater, the No. 1 Indiana University Hurryin’ Hoosiers. Christian Watford, a talented small forward who hit the last-second shot that gave Kentucky its first (of two) losses last year, returns as a senior. Other talented seniors and juniors return, as does the preseason college player of the year, 7-foot sophomore center Cody Zeller. The Hoosiers also have a talented group of incoming freshmen, including Yogi Ferrell, who will contend for the starting point guard slot. 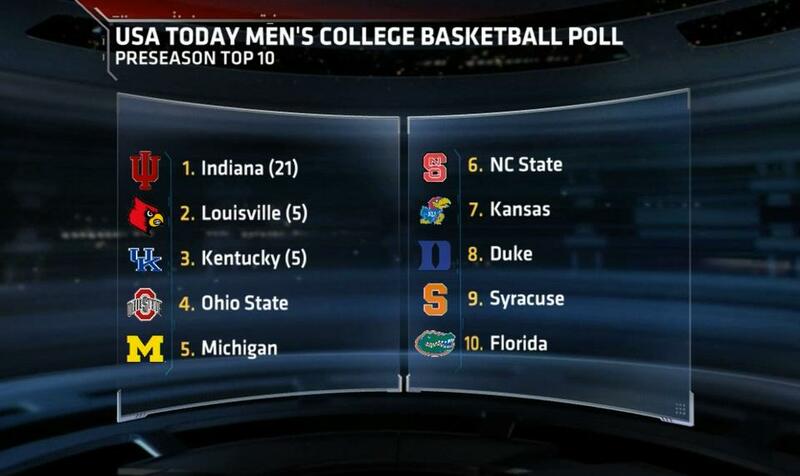 Indiana is rated No. 1 in the country in preseason polls. Kentucky is rated No. 3. The Louisville Cardinals, coached by former Kentucky coach Rick Pitino, is ranked No. 2. As a proud Kentuckianian – native of Kentucky and graduate of IU – nothing could be better. I attended IU when the basketball team only lost one game in two years. The 1976 team – with Quinn Buckner, Scott May, Kent Benson, Bobby Wilkerson, Tom Abernethy and John Laskowski – is the last undefeated team in college basketball. Given IU’s cupcake schedule leading up to Big 10 play, this year’s edition of the Hoosiers has a chance to win them all. Tonight they face some college named “Bryant,” and I don’t expect Kobe to be there in Bloomington to represent. This entry was posted in Uncategorized and tagged Cody Zeller, college basketball, Indiana, John Calipari, Kentucky, Louisville, Maryland by bymichael2012. Bookmark the permalink.